Psoriasis is a chronic (long-lasting) skin disease characterized by scaling and inflammation. Scaling occurs when cells in the outer layer of the skin reproduce faster than normal and pile up on the skin’s surface. Psoriasis affects as many as 80 million people worldwide. Although the disease occurs in all age groups and about equally in men and women, it primarily affects adults. People with psoriasis may suffer discomfort, including pain and itching, restricted motion in their joints, and emotional distress. 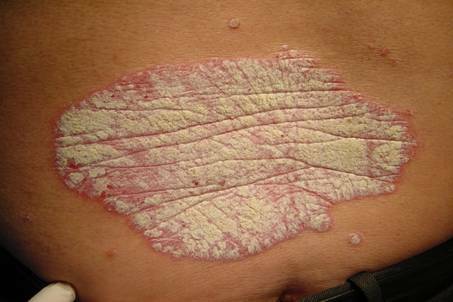 In its most typical form, psoriasis results in patches of thick, red skin covered with silvery scales. These patches, which are sometimes referred to as plaques, usually itch and may burn. The skin at the joints may crack. Psoriasis most often occurs on the elbows, knees, scalp, lower back, face, palms, and soles of the feet but it can affect any skin site. The disease may also affect the fingernails, the toenails, and the soft tissues inside the mouth and genitalia. About 15 percent of people with psoriasis have joint inflammation that produces arthritis symptoms. This condition is called psoriatic arthritis. Psoriasis and other chronic skin conditions can make life miserable for people who have them. The itching and burning is complicated by medications that are expensive and filled with potentially-dangerous steroids. There are some home remedies that can stop psoriasis and eczema in their tracks. Ask your doctor about trying some of these before you resort to costly crèmes and ointments.Herbalists suggest that red clover can act as a home remedy for skin problems. It has a high mineral content and reportedly works by changing metabolism and tissue function. Red clover can be taken in teas, compresses, ointments and syrups. Other vitamins and herbal home remedies that can treat psoriasis and other skin problems include devil’s claw root, fish oils, vitamin C, vitamin E, selenium, zinc and milk thistle. Selenium and zinc are common ingredients in over-the-counter skin and dandruff preprations. Eczema and psoriasis sufferers also swear by dead sea salt baths. You can purchase dead sea salts at your local bath or health food store and prepare a bath at home containing the salts. Speaking of baths, regular bathing can help people with eczema. Make sure to moisturize afterwards while your body is still damp, to seal in the water. Keep the water lukewarm, since that is less drying than hot water. Soak for at least 10 to 20 minutes, and don’t get out until yourskin starts to look like a prune. That means your skin is soaking in water and becoming hydrated. Don’t use soap any more than you have to. Use mild soaps with glycerine, or superfatted soaps, on important body parts. When you do dishes or clean house, wear rubber gloves to keep the cleaning products off your skin. Another home remedy to stop psoriasis and eczema is to put cotton gloves inside your rubber gloves, to absorb any sweat that the rubber gloves can produce. Your refrigerator can contain many helpful home remedies for eczema and psoriasis. Try mayonnaise as a moisturizer, and cucumber slices to ease itching. Try an oatmeal bath to reduce itching, or add olive oil to your bath water for extra moisturizer.Stress can be a big contributor to eczema and psoriasis. One simple home remedy is meditation, using scented candles or whatever else keeps you relaxed. Combine this with your soothing bath for double potency.Home remedies will not always put a stop to more severe cases of psoriasis and eczema. In that case, you should see a doctor. You should also see a doctor if eczema is oozing, the itch keeps you awake, or over-the-counter products don’t give you relief. Cabbage leaves have been successfully used in the form of compresses in the treatment of psoriasis. The thickest and greenest outer leaves are most effective for use as compresses. They should be thoroughly washed in warm water and dried with a towel. The leaves should be flattened, softened and smoothed out by rolling them with a rolling pin after removing the thick veins. They should he warmed and then applied smoothly to the affected part in an overlapping manner. A pad of soft woollen cloth should be put over them. The whole compress should then be secured with an elastic bandage. The oil of avocado has been found beneficial in the treatment of this disease. It should be applied gently to the affected parts. Vitamin E therapy has been found effective in the treatment of psoriasis. The patient should take this vitamin in therapeutic doses of 400 mg a day. It will help reduce itching and scab formation. Lecithin is also considered a remarkable remedy for psoriasis. The patient may take six to nine lecithin capsules a day-two or three capsules before or after each meal. If taken in the form of granules, four tablespoonfuls may be taken daily for two months. The dosage may be reduced thereafter to two tablespoons. Since psoriasis is a metabolic disease, a cleansing juice fast for a week is always desirable at the beginning of the treatment. Carrots, beets, cucumbers, and grapes may be used for juices. After the juice fast, the patient should adopt a well-balanced diet consisting of seeds, nuts, grains, vegetables, and fruits. Emphasis should be placed on raw seeds and nuts, especially sesame seeds, pumpkin seeds, sunflower seeds, and plenty of organically grown raw vegetables and fruits.When there is a substantial improvement, goat’s milk, yoghurt, and home-made cottage cheese may be added to the diet. All animal fats, including milk, butter, eggs; refined or processed foods; foods containing hydrogenated fats or white sugar; all condiments; and tea and coffee should be avoided. When there is a substantial improvement, goat’s milk, yoghurt, and home-made cottage cheese may be added to the diet.